Kimark’s dual flare is designed specifically for dual stream VOC control at a 98% DRE. The flare controls low pressure (i.e., storage vessel flash) and high pressure (e.g., wellhead, separator, etc.) vapor with one footprint. 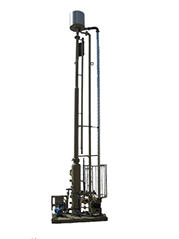 With a minimum height of thirty (30) feet our smallest version can handle flow rates of 2.5 MMCFD on the high pressure side (30 psig). At fifty (50) feet tall, our largest version is maxes out at 5 MMCFD on the high pressure side (30 psig). With three sizes to choose from and the capability to increase the vent height, Kimark dual flares can meet company safety standards/requirements and regulatory compliance regulations. KIMARK SYSTEMS OFFER A DUAL FLARE IN THREE (3) VERSIONS, DEPENDING ON YOUR APPLICATION. THE MORE FLOW, THE GREATER THE RADIATION; THEREFORE, THE HIGHER THE STACK MUST BE TO ENSURE A SAFE DISTANCE FROM FLAME CENTER. All Kimark and OTA equipment is designed to federal and state design, monitoring, and operational requirements. The dual flare is no different. It operates with a continuous burning pilot with a backup auto-ignition system to ensure that when vapors are present, they will be ignited. The on-board logging computer records equipment performance information that is important for operation and regulatory requirements. It operates in a leak free capacity with its ability to cutoff stream flow in emergency situations. The dual flare meets the standards set forth in 60.18 of the NSPS (i.e. flare tip velocity, minimum heating value, record keeping, etc. ).